Following an inexcusable delay (we've been insanely busy!) it's time for some regular posts. 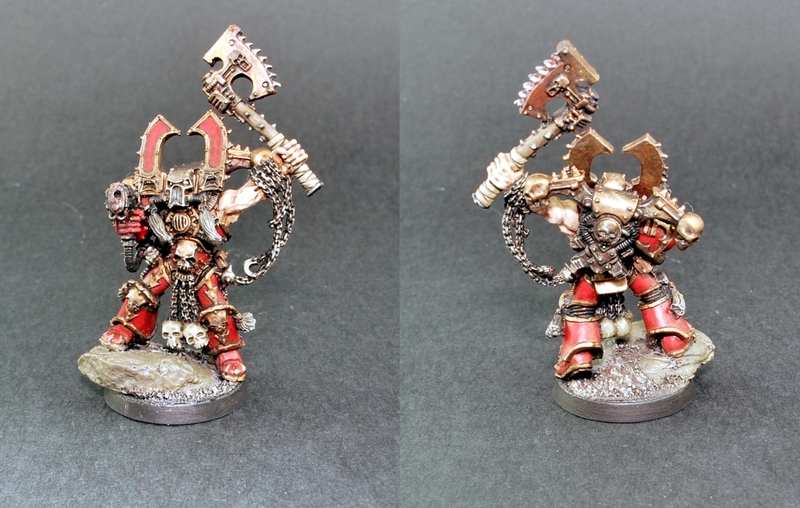 Starting with a quick short post about a recently completed commission of two 40K Chaos characters. Khârn and Typhus were painted to a High-Gaming standard on landscaped bases. Typhus also features Dark Angel remains at the clients request. Though I still consider "Finecast" to be a nightmare to work with, these two models were enjoyable to paint. Perhaps because of their bulk - they were certainly less fragile than the High Elf models Emma worked on and highlighted in the previous post. The rocks used for the bases lend weight and stability to the models which otherwise would be uncomfortably light for gaming.